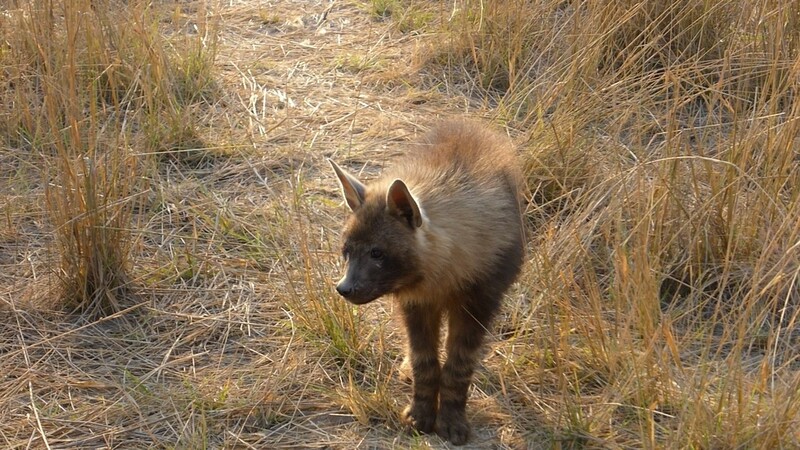 The brown hyena cubs continued to be big favourites with our guests. They were mostly seen playing in the mornings. The youngsters are growing past and were starting to separate to occupy different dens. Their mother remains elusive, visiting them in the middle of the night to bring them food that this month included an impala carcass. Bonga Pride were sometimes seen by John’s Pan and Lechwe Corner, but in general have been towards Lebala camp over the past few months. This has opened up the Lagoon territory for several new coalitions of males and during October we saw a group of four, a group of three and several pairs hunting buffaloes. Two very big males and a female were found at Kwena Lagoon feeding on an elephant carcass and mating. Several lionesses were roaming the area including three pregnant females who have broken away from the Bonga Pride. Spotted hyenas were regularly sighted around the area, mostly at abandoned buffalo carcasses that the nomad males had killed, including some exciting interactions between lions and the hyena clan. Female leopards were seen patrolling and hunting during afternoon drives. We had lovely sightings of a female with her kill up a tree and a male with a warthog kill on the airstrip road. The resident coalition of two cheetah brothers were found resting under a tree. The pack of six wild dogs (five adults and one sub-adult) were found well-fed and quenching their thirst after a successful hunting expedition. We tracked them hunting a couple of other times but they were not lucky on those occasions. Smaller predators encountered included African wild cats, servals, mongoose (yellow, dwarf and banded), bat-eared foxes and honey badgers. Black-backed jackals were denning and guests were able to see the cubs. Aquatic bird species were seen wading and foraging on the flood plains. Summer migrants continued to arrive in the area. Carmine bee-eaters were still nesting at Kwena Lagoon and John’s Pan. Guests enjoyed sightings of kingfishers, including giant and the colourful malachite. Four different species of vulture were identified feeding on the buffalo carcasses (hooded, white-backed, lappet and white-headed).